View northwest from Dead Horse Pass in the Uinta Mountains (at the head of the West Fork of the Blacks Fork drainage basin); Deadhorse Lake is in the foreground. Note the smooth talus slopes on the left compared to the wrinkled surface formed by rock glaciers in the center of the photo. At the right side of the rock glacier complex, a rock avalanche deposit cuts across an older, subdued, grass-covered moraine and is itself partly covered by a younger moraine that formed about 1600 years ago. Recent work in this basin indicates that small glaciers were likely active at this location about 3500, 2500, and 1800 years ago, as well as during the Little Ice Age (150 to ~500 years ago). The large snowfield in the distance merges with a steep-fronted rock glacier; ongoing research will attempt to determine whether or not that rock glacier is active. Photo by Jeffrey Monroe. It is a humbling experience to drive up the Mirror Lake Highway, folowing the Provo River canyon deep into the heart of the western Uinta Mountains, and realize that, in the not-too-distant past, the canyon and alpine basins above were filled with hundreds of feet of glacial ice. Yet this canyon is just one of dozens in Utah’s highest mountain ranges that held alpine glaciers during the Last Glacial Maximum (LGM), about 32,000 to 14,000 years ago. The glaciers also left behind stunning alpine scenery in the Wasatch Range, the high mountains and plateaus of central and southwest Utah, the La Sal Mountains, and even in some isolated mountains of the west desert. 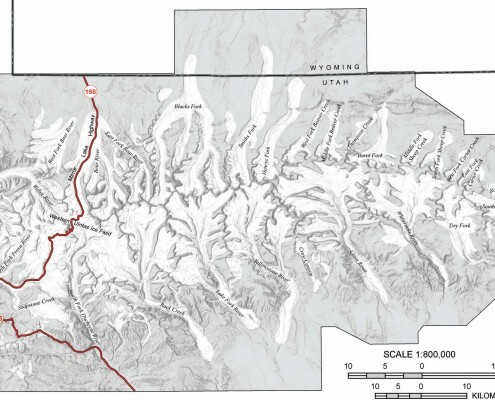 The newly published Glacial Geologic Map of the Unita Mountains Area, Utah and Wyoming (UGS Miscellaneous Publication 09-4DM) by Jeffrey Munroe (Middlebury College) and Benjamin Laabs (SUNY – Geneseo) gives us an opportunity to reflect on the state’s glacial history and what it reveals about past climate change. 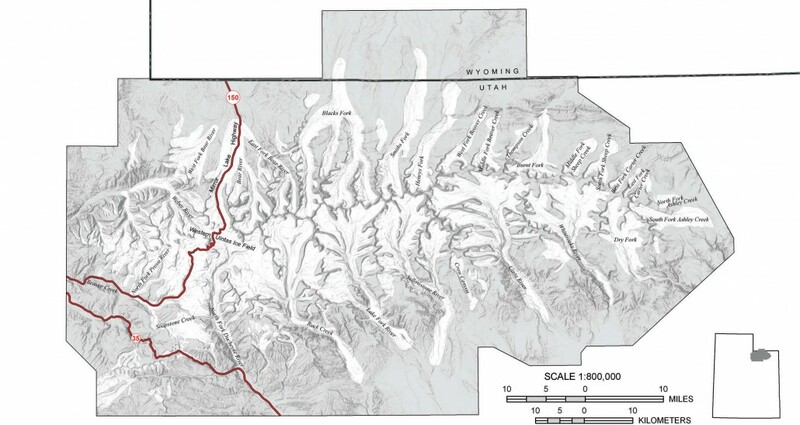 This map is the first comprehensive inventory of glacial deposits of the Uintas since Wallace W. Atwood published his seminal Glaciation of the Uinta and Wasatch Mountains a century ago in 1909. With renewed interest during the past decade spurred by development of new dating techniques, other researchers began investigating glacial deposits of the High Plateaus and Wasatch Range, collectively painting a portrait of the climate and landscape during the LGM. Alpine glacial deposits are remarkably hard to date. And, because younger glacial advances typically scour away or cover deposits of older advances, the alpine glacial record is remarkably incomplete. Of the dozens of glacial advances that have occurred worldwide over the past 2 to 3 million years, only the last two are widely recognized in the Rocky Mountain region. Traditionally, researchers have used radiocarbon dating of plant debris associated with glacial deposits to determine the age of younger (less than about 60,000 years) glacial deposits. Recently, a new dating technique that uses cosmogenic exposure ages has proven useful (the technique measures the amount of time a glacier-deposited boulder has been exposed to the sun since last being moved), enabling more robust age control and correlation to other glacial deposits throughout the region. Ironically, the best places to learn about glaciation are not in the spectacular glacier-carved U-shaped valleys themselves, but in nearby lake basins that preserve a more complete sedimentary record. In 1970, a 1000-foot-long sediment core was retrieved from Great Salt Lake. Known as the Burmester core (after the railroad causeway platform from which it was drilled), the core revealed evidence of four large freshwater lakes that occupied the Bonneville basin in the past 780,000 years. 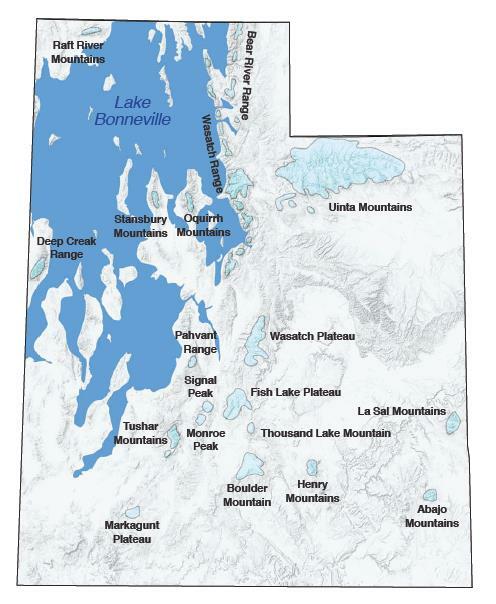 Lake Bonneville was the last of these, occupying the basin from about 28,000 to 12,000 years ago; older lake deposits include those of the Little Valley Lake (150,000 years ago), Pokes Point Lake (420,000 years ago), and Lava Creek Lake (620,000 years ago). Lake Bonneville existed during the latest glaciation of nearby mountain ranges, and in fact had a profound effect on glacier development as described below. Similar glacial episodes likely correlated with the older lakes as well. The spectacular Uinta Mountains, Utah’s highest mountain range, held the state’s largest alpine glaciers. Terminal moraines—arcuate ridges of unsorted rock and sediment that mark the farthest advance of a glacier—are among the most obvious glacial features. Heading up the characteristic U-shaped valleys, one may see recessional and lateral moraines, hanging valleys once occupied by smaller tributary glaciers, and amphitheater-like cirque basins studded with cirque and kettle lakes, striated and polished bedrock surfaces, glacial erratics, relict rock glaciers, and other glacial and neoglacial features. Downstream, valleys are choked with sediment deposited by glacial meltwater streams and rivers, which left behind terraced river channels and outwash plains now occupied by relatively small, “underfit” streams. Such features are dramatic evidence not only of the latest glaciation, but also reflect scouring by repeated glacial advances over the past 2 to 3 million years. The north side of the range held numerous long valley glaciers (the longest was the Blacks Fork glacier at 22 miles long), whereas the south side was dominated by six larger but shorter glaciers. The larger southern glaciers resulted from bigger snow accumulation areas, a result of the gentle dip of bedrock strata in this area compared to steeper dips on the north side of the range. The gently dipping strata were more easily eroded laterally by glacial action, enabling the carving of broad, high-elevation cirque basins on the south side of the range—favorable areas for accumulation of large amounts of glacial ice. One of the most remarkable features of Uinta Mountain glaciation is the profound effect that Lake Bonneville had on glacier development. 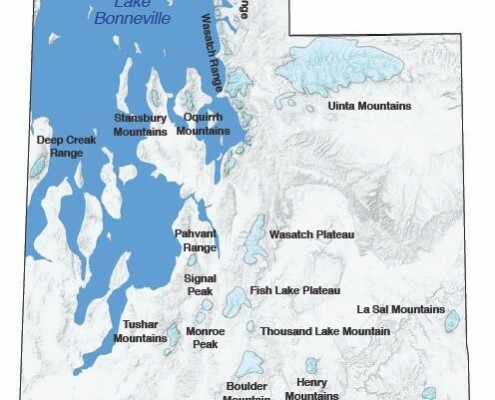 As a result of lake-enhanced precipitation from Lake Bonneville, glaciers grew larger and extended to lower elevations in the western part of the Uintas, which was closer to the lake (Great Salt Lake produces a significant though smaller version of “lake effect” precipitation today). Also, glaciers in the southwestern Uinta Mountains and nearby Wasatch Range retreated from their maximum extent by about 17,000 years ago, 2000 to 4000 years later than glaciers in other Utah mountain ranges. This was likely due to the enhanced precipitation, which allowed glaciers to survive longer through otherwise increasingly warmer and drier conditions at the end of the LGM. 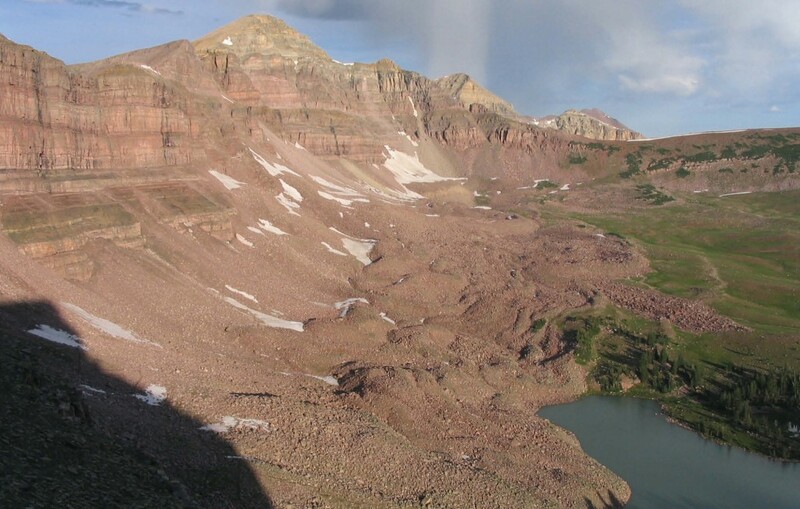 Although the LGM peaked about 17,000 years ago in the Uinta Mountains, small cirque-floor moraines in the highest parts of many north-flank drainages provide evidence that small glaciers formed a few times since then. These moraines reflect small ice advances in latest Pleistocene to early Holocene time, and two drainages contain evidence of small glaciers in late Holocene time (last few thousand years). In many areas in the Rocky Mountains small glaciers also formed during the “Little Ice Age,” which was just 150 to about 500 years ago, but few are recognized in the Uinta Mountains, possibly because of inadequate winter snowfall during this time. However, rock glaciers—surficial masses of ice-cored rubble that move downslope due to flowage of internal ice—are present above 10,000 feet; many of these may have been active during the Little Ice Age. Today, most appear to be dormant, but some exhibit evidence of active flow, including unvegetated, oversteepened fronts, ridges and troughs, ponds of silty meltwater, and springs near their toes. Parts of the Wasatch Range were also sculpted by glacial ice, nowhere more dramatically than at Little Cottonwood and Bells Canyons. Recently, Elliott Lips (Great Basin Earth Science, Inc.) and his colleagues studied new exposures near Little Cottonwood Canyon that revealed that ice advanced past the mouth of the canyon several times, including at least two minor advances before or during the highstand of Lake Bonneville about 18,000 years ago and at least one around 16,000 years ago, after the highstand. The moraine on the south side of the mouth of Little Cottonwood Canyon is much larger than the moraine on the north side because larger tributary glaciers entered the canyon from its south side (some formed classic hanging valleys visible in the canyon’s lower reaches today). Conspicuous large granitic boulders on the north side of the canyon mouth record the height of glacial ice in this area. A much smaller ice advance in upper Little Cottonwood Canyon near Alta may have formed during a period of global cooling 12,800 to 11,500 years agocalled the Younger Dryas (at this same time, a nearly desiccated Lake Bonneville rose to about 60 feet above the average level of today’s Great Salt Lake, forming the Gilbert shoreline). Just south of Little Cottonwood Canyon, the much larger Bells Canyon moraine shows that its glacier remained stationary for a longer time, indicating that it was less influenced by events that caused the Little Cottonwood glacier to undergo several minor advances and retreats. In addition to providing clues about the last glaciation, the Bells and Little Cottonwood Canyon moraines provide other important geologic information. Both are cut by the Wasatch fault, and studies of the faulted deposits have revealed valuable information on the recurrence history of major earthquakes that shook Salt Lake Valley. Does Mount Timpanogos Have a Glacier Today? Mount Timpanogos, the second-highest mountain in the Wasatch Range, dominates the eastern skyline of Utah Valley. During the late 1800s and early 1900s, the cirque basin below the peak of Mount Timpanogos held a permanent snowfield that has been called “Utah’s glacier” or “Timp glacier”; since then, a small snowfield commonly remains in that area throughout the year. Whether or not glacial ice was ever present in recent historical time has not been rigorously documented, but is doubtful. The site now appears to be a relict rock glacier, but ice could still be present at its core. Most of Utah’s highest mountain ranges and plateaus, those soaring over 8200 feet in elevation in northern Utah and over 10,000 feet in southern Utah, show evidence of glaciation. Isolated ranges in western Utah, including the Stansbury Mountains, Deep Creek Range, and Raft River Mountains, show evidence of significant alpine glaciers. Towering over the redrock desert near Moab, the La Sal, Henry, and Abajo Mountains also held glaciers during the LGM. Among the best studied glacial deposits outside of the Uinta Mountains and Wasatch Range are those in the High Plateaus of central and southern Utah. This region is the focus of recent work by Western State College of Colorado geologist David Marchetti, who combines geologic mapping and cosmogenic dating techniques to tease apart the history and past climates recorded by these deposits. 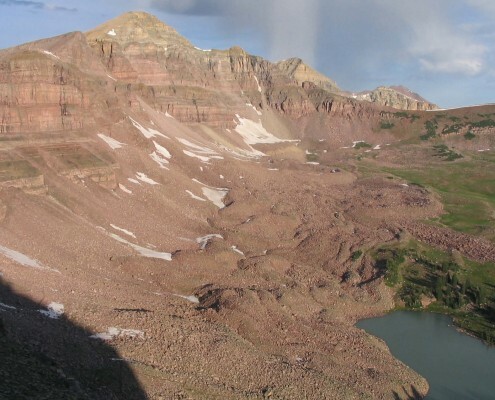 The Wasatch, Sevier, Markagunt, and Aquarius Plateaus, and the Pahvant Range, Tushar Mountains, and Boulder Mountain all have documented evidence of glaciation during the LGM, and many show evidence of an earlier glaciation. Other slightly lower ranges may have had small glaciers. The Crystal and Lowder Creek basins east of Brian Head on the Markagunt Plateau hold the southernmost glacial deposits in Utah. Recessional and lateral moraines and hummocky, stagnant ice topography are locally well developed, but sculpted bedrock is absent or inconspicuous, probably owing to the relatively small size and suspected short duration of the glaciers. Recent mapping by the UGS has revealed an older terminal moraine in front of these LGM deposits. Utah’s mountains also contain ancient deposits associated with the world’s most severe ice age, which occurred during the Precambrian Cryogenian Period, a time commonly referred to as snowball earth. Glacial deposits from this time are present in bedrock in Big and Little Cottonwood Canyons, on Antelope and Fremont Islands, and in several other western Utah mountain ranges. 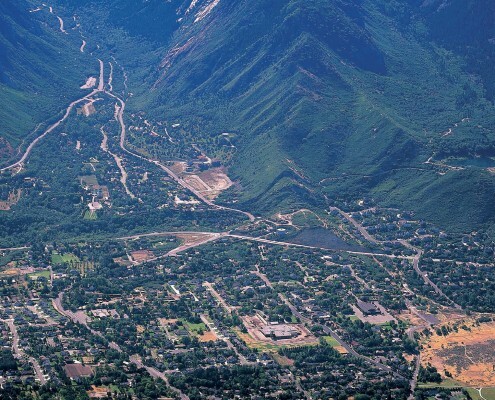 In the Wasatch Range, these 700- to 750-million-year-old deposits are known as the Mineral Fork Formation, poorly sorted and now-lithified sediment deposited from a retreating Greenland-like continental ice sheet that cut across underlying coastal-plain, estuarine, and tidal-flat sediments of the Big Cottonwood Formation. The stunning alpine scenery of Utah’s highest mountains is the cumulative effect of repeated alpine glaciations over the past 2 to 3 million years that is linked to a worldwide pattern of glacial and interglacial cycles. Because successive glaciers typically overrode or buried older glacial deposits and landforms, only those of the last two glacial episodes are well documented in the state. Utah was largely ice-free by about 14,000 years ago, but younger glacial deposits from small ice advances associated with more recent minor climate fluctuations are known in the Uinta Mountains and High Plateaus of southwest Utah, and suspected in other areas. No glaciers are present in Utah today, but rock glaciers are known in many ranges; most are doubtless dormant, but some may still be active, including several in the Uinta Mountains. Bob Biek is a Senior Scientist with the UGS’s Geologic Mapping Program. Since joining the Survey in 1996, he has published over two dozen geologic maps of 7.5′ quadrangles along Utah’s Wasatch Front and in the Heber Valley area, as well as in southwestern Utah. He was the lead author on the recently published St. George 30′ x 60′ quadrangle geologic map, and is currently in the middle of a four-year effort to compile a geologic map of the Panguitch 30′ x 60′ quadrangle. Grant Willis has been a mapping geologist with the UGS for 27 years, including 16 years as manager of the Geologic Mapping Program. He has authored or coauthored over 40 geologic maps, and is currently mapping Glen Canyon National Recreation Area. J. Buck Ehler has been a Geographic Information Systems (GIS) Analyst/Cartographer with the UGS Geologic Mapping Program for five years. He is a proud Utah native who grew up in Emery County. Buck graduated from Utah State University with a bachelor’s degree in Geography with minors in Geology and GIS.